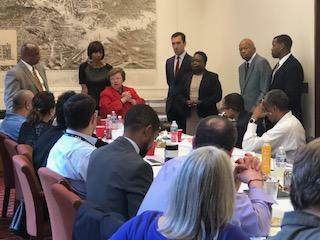 Congressman Elijah Cummings, Senator Barbara Mikulski, and Baltimore Mayor Catherine Pugh make guest appearances at the City Council luncheon yesterday afternoon to talk about the 2020 census. The Baltimore City Council was back in session Monday evening with a long list of new legislation. Morning Edition's Host Nathan Sterner speaks with Reporter Dominique Maria Bonessi about what happened. NATHAN: District Three Councilman Ryan Dorsey put forward two measures yesterday, one of them was about kids playing in the street? DOMINIQUE: Councilman Dorsey had one bill related to an old police ordinance which would charge kids with a misdemeanor for playing in the street and alleyway. Guaranteed it is unclear how many juvenile arrests in the city are due to kids playing ball in the street, but Dorsey said this. DOMINIQUE: The second bill along those same lines, works to reduce the speed limits in the city. Dorsey cited statistics from Vision Zero, a program for US cities to increase road safety for pedestrians and get car crash fatalities to zero, saying if hit by a car going 20 miles per hour a pedestrian as a one in ten chance of survival, and the faster the car goes the lower the chances of survival for the pedestrian. Baltimore Department of Transportation did adopt a version of this called Towards Zero in 2016, but Dorsey says they’ve been slow to act on it and hopes this legislation will help push things along. NATHAN: Speaking about speed limits and car accidents, the city council is also putting forth a resolution for the state to require car insurers to stop charging Baltimore residents more for their insurance premiums than the rest of the state. How would that work? DOMINIQUE: City Council members today said that car insurers in Baltimore City discriminatory charge residents more than other counties in Maryland. City Council members argue that while Baltimore City has the more car accidents than other counties, the people in those accidents aren’t necessarily from city residents. According to police records, the majority of traffic citations in the city are given to people who do not live in the city. Fourth District Councilman Bill Henry said rather than adjusting rates for residents based on zip codes, there are other ways to determine rates. A second option, if state legislature can’t come up with legislation to make this happen, Council President Jack Young says he is working with State’s Attorney Brian Frosh’s office to file a law suit against car insurers saying their high insurance premiums are discriminatory. NATHAN: There was a surprise guest appearance by Mayor Catherine Pugh, Congressman Elijah Cummings, and Senator Barbara Mikulski at the City Council luncheon yesterday afternoon, and they were advocating for another resolution that made its way onto the floor last night right? DOMINIQUE: Yes, Mikulski, Cummings, and Pugh were at city council to encourage council members to assist with a resolution to support the 2020 census. As we’ve heard reporting from NPR, this upcoming census has been very contentious for democrats. Cummings is the highest ranking member on the United States House of Representatives’s Committee on Oversight and Government Reform, and has said that he will take the census question of whether or not someone is a citizen to the Supreme Court. Another concern that Mikulski and Cummings shared with the council is the fact that this will be the first census that is done entirely online. Here’s Cummings. DOMINIQUE: Indeed, approximately 74,000 households in Baltimore lack internet access, according to 2017 research from the Robert Deutsch Foundation. City council is working on also opening up city hall as a center for people to access the internet to fill out their census forms.